Reading a friend’s manuscript, cont. I’ve had a few people ask about the friend whose story I’m reading. 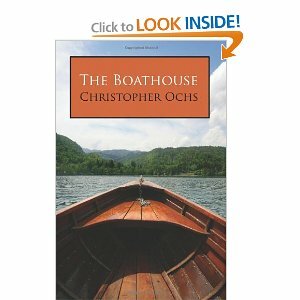 His name is Christopher Ochs and this is the second book he’s completed. The Western flavor of the new one is more attuned to my liking, though I have read the romance that is The Boathouse at least 3 times. I’m still reading the new manuscript, though why I haven’t finished is no commentary on the work itself. I’ve just been busy with (insert lame excuse here). But it’s travelled with me since I turned the first page, meaning that it smells of campfire smoke, is slightly wrinkled from pouring rain, and may have a small food stain. And of course, a few handwritten notes in my characteristic sticks-n-slashes handwriting. I”ll be reading a friend’s manuscript tonight. I’m kind of excited because I enjoy reading people’s rough drafts. It’s a great way to see into the writing process of others and it helps me polish my own editing and storytelling skills. But more than that, it’s a way to re-inspire me. I’ve found that, aside from a brand new idea popping into my head, reading what someone else is doing is like throwing gasoline on a fire. I’ve done some of my best writing after reading or discussing a friend’s work. His story is a Western that he’s been working on for a couple years. We haven’t talked about it much since he first told me was starting it–aside from brief conversations about how it was going–so I’m coming to it fresh (meaning, I won’t be able to tell whether anything has changed from his original concept, which can be distracting). This comes at a great time for me since I’m kicking around a Western story of my own. Neither one of us are actually Western enthusiasts (purists? ), though I grew up on John Wayne movies and Clint Eastwood spaghetti westerns. And he has done research of his own during the writing of his book. This can be both good and bad. Both of us could bring a fresh perspective to the genre, though at the same time, we might miss the things that the great Western stories always have. We’ll see. Now I just need to find a cozy spot. PS: Ugh, my writing this morning is like a washboard gravel road. Need more coffee.